Question of the Month 16 www.seniorshousingbusiness.com Seniors Housing Business n May-June 2018 Pat Byrne Pat Burke $5 BILLION IN SALES TRANSACTIONS 860 SOLD SENIOR HOUSING COMMUNITIES 1997-2018 Grant A. Kief, President (630) 858-2501 (314) 961-0070 www.slibinc.com Jason Punzel Matt Alley Jeff Binder Ryan Saul Jeff Clousing Nick Cacciabando Dan Geraghy Kyle Shoemaker Dan Piatkowski Brad Clousing Toby Siefert Dave Balow Brad Goodsell Our experts will help you get a "Top-of-the-Market" price for your Seniors Housing community. Teamwork = Results We have 17 seasoned professionals that are national experts in the Seniors Housing and the Affordable Housing market. 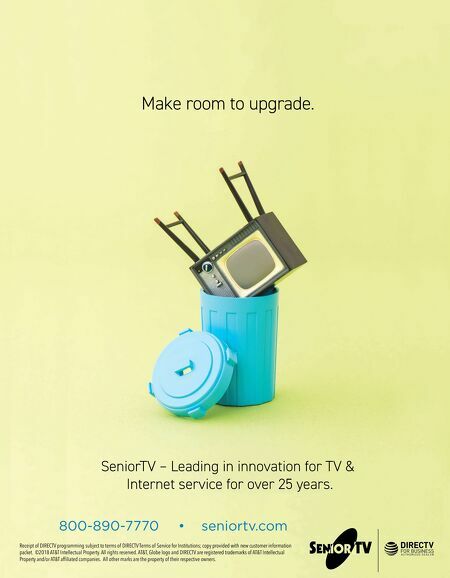 Together we have over 175 years of experience. Contact us for a confi dential valuation of your Seniors Housing community. Vince Viverito Joe Young Do you expect government regulation to increase for assisted living? What regulations are you planning for? Most occurs at state level By David Schless President ASHA Given that the cur- rent administration is focused on regulatory rollback, I don't believe there is a direct threat of federal regulation for the assisted living industry at this time. For operators who choose to participate in federal programs such as Medicaid and HUD hous- ing subsidy programs, rules changes and general oversight are the norm and will continue. New expansions in Medicare Advan- tage plans may offer new assisted living benefits. For those who choose to pursue those benefits, they will also come with federal oversight. Most regulation occurs at the state level. While there is much activity to increase regulatory requirements, the key areas of focus remain in the areas of staff- ing, medication management and dementia care. Regulations can bring value By James Balda President & CEO Argentum I expect regula- tions at the state level to increase, mostly centered on issues related to resident safety. We are pleased to see a number of state senior living organizations actively focusing on these issues, which include enhanced employee screening and training, and emer- gency preparedness measures. As we advocate for addi- tional services to be made avail- able to seniors in assisted living and memory care residences, we understand and embrace the increased regulatory oversight that comes with these services so our residents can receive what they need where they choose to live. Laws in some areas are woefully inadequate By Joel Goldman Partner Hanson Bridgett Increased regulation of assisted living is inevitable as "acuity creep" continues. I expect to see a focus on specific staff- ing requirements/ratios as many states now require only "adequate staff to meet resident needs." I anticipate more regulation per- taining to emergency response/ evacuation in light of recent natu- ral disasters. I also anticipate regu- lation pertaining to new technolo- gies as regulators try to balance resident privacy with safety and security considerations. Finally, I hope that we will see thoughtful legislation or regula- tion pertaining to sexual activity among dementia residents, as cur- rent laws are woefully inadequate. 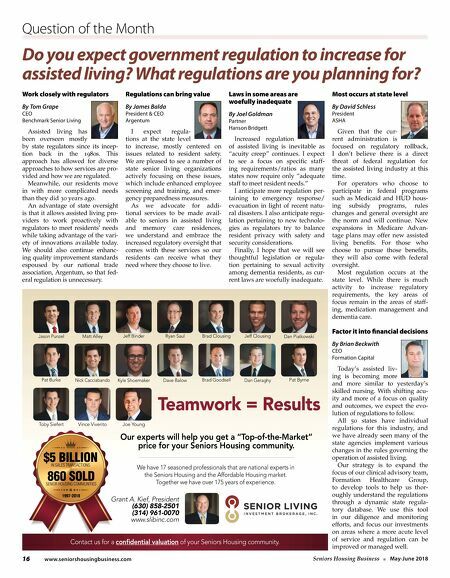 Work closely with regulators By Tom Grape CEO Benchmark Senior Living Assisted living has been overseen mostly by state regulators since its incep- tion back in the 1980s. This approach has allowed for diverse approaches to how services are pro- vided and how we are regulated. Meanwhile, our residents move in with more complicated needs than they did 30 years ago. An advantage of state oversight is that it allows assisted living pro- viders to work proactively with regulators to meet residents' needs while taking advantage of the vari- ety of innovations available today. We should also continue enhanc- ing quality improvement standards espoused by our national trade association, Argentum, so that fed- eral regulation is unnecessary. Factor it into financial decisions By Brian Beckwith CEO Formation Capital Today's assisted liv- ing is becoming more and more similar to yesterday's skilled nursing. With shifting acu- ity and more of a focus on quality and outcomes, we expect the evo- lution of regulations to follow. All 50 states have individual regulations for this industry, and we have already seen many of the state agencies implement various changes in the rules governing the operation of assisted living. Our strategy is to expand the focus of our clinical advisory team, Formation Healthcare Group, to develop tools to help us thor- oughly understand the regulations through a dynamic state regula- tory database. We use this tool in our diligence and monitoring efforts, and focus our investments on areas where a more acute level of service and regulation can be improved or managed well.